Do all children love to tell stories? I know my daughter does. She can come up with some pretty involved tales all starting with the phrase, "Once upon a time." Storytelling helps with literacy development. Preschoolers that actively tell stories enlarge their vocabularies while also increasing their language and comprehension skills. Although my daughter does pretty well telling stories without any prompting, I've noticed that her stories become more elaborate when she is supplied with visual aids. 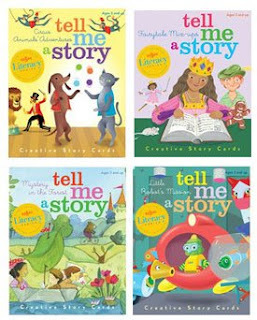 eeBoo produces an award-winning product called Tell Me a Story Creative Story Cards. The cards are part of their early learning literacy series. 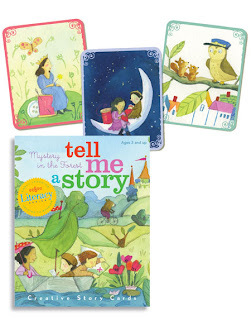 Meant for ages 3 and up, the deck of 36 beautifully illustrated cards assist children in creating their own stories. An endless number of stories are possible by placing any number of the cards in any order. Short stories, long stories, kids create a new story every time they shuffle the deck. 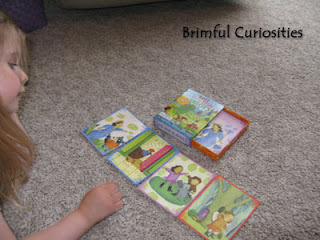 The whole family can make a game out of the cards, by taking turns picking cards and telling a story together. Parents and teachers will find the cards useful as an aid in their own storytelling. eeBoo offers four different sets: Circus Animal Adventures, Fairy Tale Mix-Up, Mystery in the Forest and Little Robots Mission. eeBoo sent us our own set of Mystery in the Forest to review. The pictures in our set feature all sorts of mysterious scenes and characters, from squirrels, a raccoon and a bird to a crown-wearing lady and a treasure chest. Land, sea, forest, meadow, castle, sky...so many settings for an intriguing mystery. Sized small at about 4" x 5", the cards pack easily in a bag, perfect for travel and come in a sturdy sliding tray box. Because the set is priced reasonably at $9.95, we plan on buying a few of the other sets for more storytelling possibilities. I imagine you can even mix the sets together and make up some pretty wacky stories! My daughter has a pretty awesome imagination, and I've really enjoyed listening to her tell me some excellent stories. I've been particularly pleased because the set encourages her to speak her mind and become a little more vocal, skills that she needs to practice before she starts school next fall. Win a set! eeBoo has kindly offered to give away (1) deck of Tell Me a Story Cards to a Brimful Curiosities reader. To enter, visit www.eeboo.com and leave a comment with the name of another eeBoo product you'd like to own. • Contest ends on Monday, June 22th, 2009 at 11:59 PM CST. 2nd extra entry: Blog about this contest then post your link in the comment section. 3rd extra entry: Follow me on twitter (iambrimful) and tweet about the contest. I like the Lotto Game for preschoolers. All their games look super cute! I like the paper dolls! What a fantastic giveaway! I love eeboo products. I think the preschool bug dominioes game is too cute! I'd love the circus animal adventure tell-me-a-story cards. Great idea! I'm also a follower through bloglines. Thanks! oops! sorry! didn't exactly read the directions. An ADDITIONAL product from eboo that I'd like are the courtesy notecards. Love the butterfly ones! I subscribe through Google Reader. My kids would love the pre-school matching game. Eeboo products look pretty cool! These look fabulous. I would love to utilize these with my little ones. I already follow this blog via GoogleReader. I'd love to play the Bug Dominos with my 4 year old! We have almost every eeboo product ever made! lol! This is one of my favorite toy companies! My daughter LOVES these Tell Me a Story cards! We have every set! We love the board games like The Tea Party Game, The Paper Doll Game, The Picnic Game and the Happy Birthday Game! You can't go wrong with eeboo!!! I really love the eeBoo Paper Dolls Set of 3. Those are so cute! Thank you so much! Travel Dominoes looks like fun! The Preschool Nature Matching Game looks wonderful too! I'd like the Christmas Parade Advent Calendar. I am loving the Advent calendars! I like Animal Sounds Tot Tower. My boys would like the bug domino game. I am a new follower on blogger. Fairytale mix-ups Tell Me a Story is great! I'd love the "Make Me a Pie" basic skills game. I love the Paper Dolls. I love the travel games and the paper dolls. I could definitely use the Tell a Story cards as I am a librarian. I would like to own the Alphabet Tray Puzzle to help my little one learn the alphabet. Thanks! I subscribed via Yahoo reader. Thanks! I love the Caroling Mice Advent Calendar! The Friendly Insects Lacing Cards. My daughter would like the Travel Matching game. So many fun games! I also like the Circus Growth Chart. Their French Bingo looks fun, too. Thanks for the giveaway! Wordless Wednesday - Peter Rabbit?